The holidays are all about celebrating with family and close friends...and a big part of that is enjoying the fellowship that only good food and drinks can provide. This week, #SundaySupper is partnering with Gallo Family Vineyards to celebrate holiday meals and traditions. 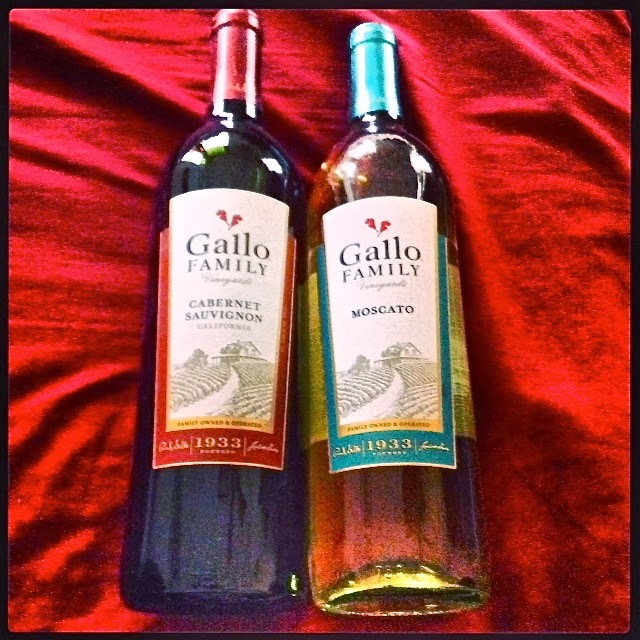 Gallo offers a wide variety of wines to suit everyone's tastes! I was excited to receive a bottle of their Moscato and Cabernet Sauvignon to create a holiday recipe to share today. I enjoyed drinking the sweet, light Moscato...and I cooked up a special treat using the Cabernet. meal, but Christmas Eve is all about casual food. My extended family on Dad’s side gets together for a potluck and white elephant gift exchange on Christmas Eve. We laugh a lot, enjoy lots of great food, read the Christmas story and end the night with the gift exchange. It’s one of my favorite parts of the holidays! This year, my parents are hosting the event...and I’ll be sharing these flavorful Cabernet-Shallot Mushroom Cheeseburgers. With Gallo Family Vineyards’ Cabernet Sauvignon flavoring both the meat and the mushrooms, these burgers are upscale comfort food. Although I made these burgers full size for this article, I’m planning to serve them as sliders for our Christmas Eve party. Step 1: Reserve 1/2 cup of the wine for the mushrooms. Pour the rest of the bottle of wine into a medium saucepan and add the shallots. Bring to a boil over med-high heat, then cook until reduced. This will take about 20 minutes. Add 1 tbs. butter and the brown sugar to the reduced wine-shallot mixture. Stir until the butter melts and the sugar dissolves. Remove the sauce from the heat. Step 2: While the wine-shallot mixture is reducing, combine the remaining butter with the rosemary, thyme and garlic to make a compound butter. Set aside. Mix the beef, salt and pepper, and 1/3 cup of the cabernet-shallot sauce. Form into four patties the same shape and size as the focaccia rolls. Step 3: Add 2 tbs. butter to a small non-stick saute pan over med-high heat. When the butter is melted, add the garlic and mushrooms. Cook for 5 minutes, until the mushrooms begin to soften and brown. Reduce heat to medium and add the red wine; cook until the wine has mostly been absorbed by the mushrooms, approximately 5 minutes. Step 4: Oil and heat a cast-iron grill pan over med-high heat. Add the burger patties and cook until browned on the bottom -- approximately 4-5 minutes. Turn the burgers and brush with more of the cabernet-shallot sauce. Continue to grill and baste the burgers until they reach desired doneness. Sprinkle each with 1/4 cup of the shredded cheese and cook until melted. Step 5: To assemble, liberally spread the cut sides of the focaccia with the herb butter. Grill until toasted and golden brown. Top the bottom half of each bun with a burger patty, 1/4 of the mushrooms, and the field greens. Serve with chips or french fries...and more wine! These upscale bistro burgers are amazing thanks to Gallo Family Vineyards Cabernet infused into the burgers and the mushrooms. The cabernet-shallot sauce brushed on top of the burgers as they grill is slightly sweet, which worked really great with the sharp cheddar and earthy mushrooms. The fresh herbs on the buns provided a nice background flavor too. These burgers are casual fare that's fancy enough to feed guests. Because they can be prepared indoors using a cast-iron grill pan, they can be enjoyed all year long! Gallo Family Vineyards is very active with social media, so I hope you’ll take a moment to Like them via Facebook, Follow them on Twitter and Instagram, and check out their YouTube channel so you can stay up-to-date with all of their latest news and promotions. 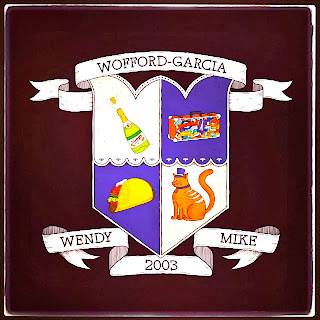 To get started, you can create a personalized family crest by using their Crest Creator. This interactive tool is really fun...I recently created a crest for my family. 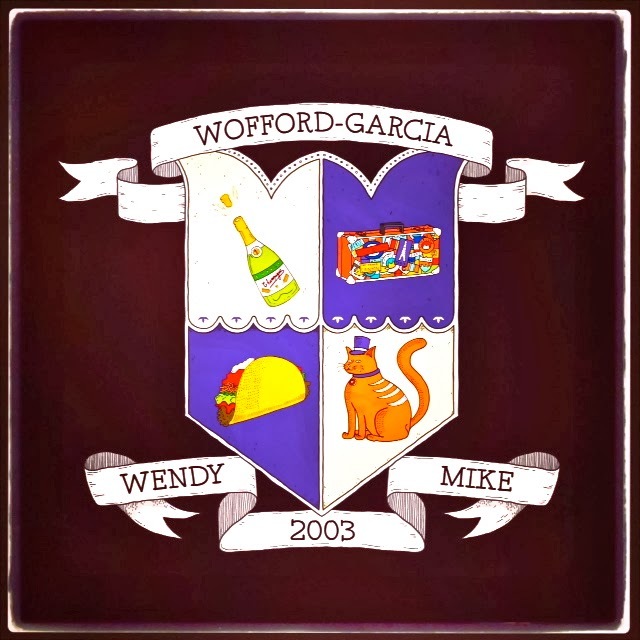 As you can see, the Wofford-Garcia crest features some of our favorite things: bubbles (!! ), travel, Tex-Mex food and cats! Be sure to join the #SundaySupper conversation on Twitter this evening! We tweet throughout the day and share recipes from all over the world. Our weekly chat starts at 7:00 pm ET. Follow the #SundaySupper hashtag and remember to include it in your tweets to join in the chat. Check out our #SundaySupper Pinterest board for more fabulous recipes and food photos. In the meantime, I hope you’ll click on the links below to check out all of the fabulous recipes featuring Gallo Family Vineyard wines that the rest of my #SundaySupper participants are sharing. You’re sure to find something that will be perfect for upcoming holiday parties!